City Manager Jill Keimach secretly taped two Alameda councilmembers. 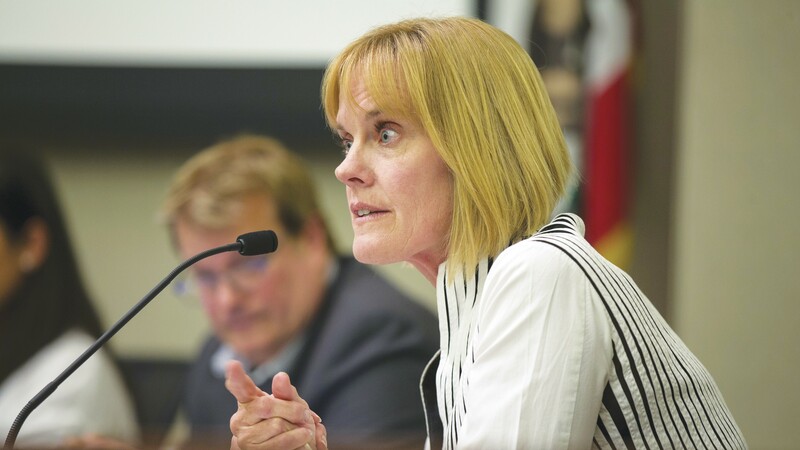 The Alameda City Council voted unanimously on Monday night to ask the District Attorney's Office to investigate the illegal taping of two city councilmembers by City Manager Jill Keimach. But the council stopped short of firing Keimach, whom the council placed on leave last month after an independent investigation found she had secretly recorded a conversation in 2017 with Councilmembers Jim Oddie and Malia Vella. The council also voted unanimously to release on May 2 the results of an independent investigation into Keimach's allegations that Oddie and Vella interfered in the selection of the new fire chief last year in violation of the Alameda City Charter. The Express was first to report on its website last week that Keimach had surreptitiously recorded Vella and Oddie without their consent. It is illegal in California to record private conversations without the OK of everyone involved. According to two knowledgeable sources, Keimach also secretly recorded a conversation with another city official in an unrelated matter. In addition, at least two other people now say that they believe Keimach illegally recorded them as well: Assemblymember Rob Bonta, D-Alameda, and Jeff Del Bono, head of the Alameda firefighters' union. One of Keimach's attorneys, Karl Olson, initially denied in an interview with the Express last week that Keimach had secretly taped Oddie and Vella. But Keimach subsequently admitted to KCBS Radio that she had done so. Later, Keimach's attorneys told the San Francisco Chronicle and the East Bay Times that Keimach said Alameda City Attorney Janet Kern approved the secret recording. But Kern strongly denies that claim, calling it a "bald-faced lie" and implying that she might sue Keimach for libel. "To be completely clear as to the false allegations being made about me by Ms. Keimach and her lawyers, I absolutely did not advise Ms. Keimach that she was authorized to surreptitiously record two city council members. Those statements are false and potentially legally actionable," Kern wrote in an email to me. For their part, Keimach's attorneys now assert that Kern is lying and that Kern, Oddie, and Vella should not be involved in discussions over Keimach's fate. Keimach's attorneys also argue that it was legal for the city manager to secretly tape her bosses. In a letter to the council, attorney Therese Cannata asserted that under California Penal Code 633.5, it's OK to secretly record someone if she "reasonably believes that it will obtain evidence related to the commission of certain crimes, including bribery, extortion, and a felony involving violence against the person." However, it's not clear if that section of the penal code applies in this case because Keimach asserts that she believes Oddie and Vella were going to violate the Alameda City Charter, which is not a felony. In an interview, Cannata said they welcome an investigation by the Alameda County District Attorney's Office because they believe it will prove that Oddie and Vella violated the city charter. "I don't think it would turn out well for these two councilmembers," Cannata said. The scandal that has engulfed Alameda City Hall started last August. Frustrated with what she would later call "unseemly political pressure" by political leaders and union officials in an effort to lobby her to select a candidate for fire chief backed by the Alameda firefighters' union, Keimach decided she needed evidence to prove that Oddie and Vella were violating the city charter provision that forbids elected officials from interfering with her authority to hire and fire department heads. On Aug. 16, Keimach met with Oddie and Vella at the City Manager's Library at City Hall and secretly used a digital recorder to tape their nearly hour-long conversation. Under California law, recording another party without consent carries a sentence of up to one year in jail. In October, Keimach wrote a scathing letter to the council, alleging that Oddie and Vella had urged her to select the firefighters' union's pick for fire chief — Domenick Weaver, a 25-year veteran of the department — in "the best interest of labor peace." Police Chief Paul Rolleri also told the East Bay Times that Oddie told him Keimach risked being fired if she didn't select the right candidate for fire chief. But then Weaver pulled his name from consideration for the job on Aug. 29, expressing frustration over not getting a fair shake from Keimach. "Never before have I been witness to a more unprofessional selection process in the city than the one you are currently conducting to fill an executive management team and critical public safety position," he wrote in a letter to Keimach. She later hired Ed Rodriguez of the Salinas Fire Department as Alameda's fire chief. After Keimach's letter to the council, the council voted to hire an independent investigator — attorney Michael Jenkins — to probe Keimach's allegations. Then during the investigation, Keimach admitted to Jenkins that she had secretly recorded Oddie and Vella and handed over the tape. Two sources said Jenkins initially refused to listen to the recording out of fear of abetting a potential crime. Jenkins did not respond to a request for comment for this report. After councilmembers found out what Keimach had done, they voted unanimously on March 9 to place her on administrative leave. In an interview, Assemblymember Bonta said he also suspects Keimach recorded him during a phone conversation sometime last September to discuss his support for Weaver. "When the conversation was over I thought, 'Did she just record me?'" Bonta said. Keimach seemed awkwardly guarded during the conversation and often asked him to repeat his comments like "she was trying to capture something," he said. "I've taken depositions before, so I know you try to get a clean answer so you can use it in court without ambiguity." Sources told the Express that a second, but apparently unrelated conversation involving Keimach and a city department head, is also on the recording handed over to the independent investigator. "I'm not sure it ends where she's admitted. There could be others. There's an employee. There's two others. There might be four? Who knows how many? There's a pattern and practice of her doing this to people," said Bonta. "I want accountability and vindication of my rights." Del Bono, president of Alameda Firefighters Local 689, also believes Keimach secretly recorded him around the same time as Bonta last September. Del Bono, who also clashed with Keimach over the fire chief selection process, said that during a chat over coffee, Keimach continually repeated his comments back to him as if to make them clear for a recording. Del Bono said that a day earlier, he ripped Keimach over the phone after disagreeing with her pick for interim fire chief. "Why does this lady, who I just told was the most dishonest person I've ever worked with, want to talk to me so badly?" he said. "When I got home I told my wife, 'I think she recorded me.'" Cannata strongly denied that Keimach recorded another city employee or anyone else. "She made only one recording. It happened once in her many, many years' career. The rumor mill about Mr. Bonta or this manager — I don't know who is putting it out — but it's patently false. It's not true. It didn't happen," said Cannata. "I think there's a difference between I support a particular candidate versus spending 59 minutes in person saying if you don't support that candidate there's going to be consequences for you, such as losing your job, such as having problems during the next labor situation, such as losing support of the fire department during times of critical need." The city is bracing for a slew of lawsuits over the scandal. Keimach is eyeing litigation, and so are Oddie and Vella. At City Hall on Monday night before the council went into closed session to discuss the potential litigation and whether to fire the city manager, Keimach urged the council not to terminate her, pointing to her list of accomplishments. In addition, many of Keimach's backers, including members of pro-landlord groups, showed up to support her. They oppose Oddie and Vella because the two voted last year in favor of just-cause tenant protections, which many landlords are adamantly against.